The Man Saver Post Driver is all about playing hard and working smart. 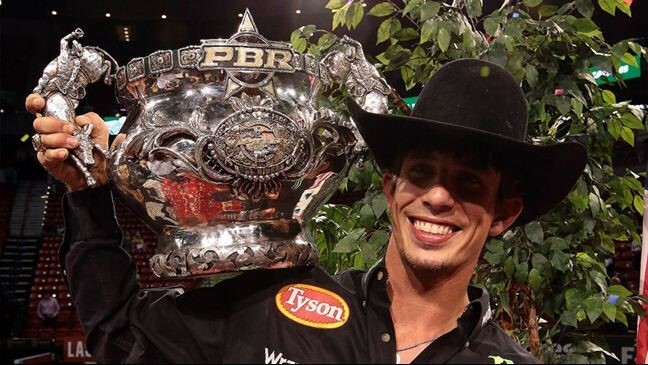 After watching this year’s Professional Bull Riding (PBR) World Finals in Las Vegas on October 21-25, it’s obvious that J.B. Mauney embodies that lifestyle to the fullest. The newest world champion from Mooresville, North Carolina, now has 2 gold buckles and is the first $6 million dollar man in Professional Bull Riders history. After the finals, Mauney sits alongside fellow PBR legends Adriano Moraes, Silvano Alves, Justin McBride, and Chris Shivers as the only five riders in history to win multiple championships. “I just ride bulls. Some guys go to the gym, they work out all of the time, constantly doing stuff. But I figure we’ve got horses, I catch cows, we rope – there’s enough stuff that I’m doing during the week where I’m at home to keep me in shape. And I don’t need to go to the gym. But I think that riding horses, besides getting on bulls, is the best thing you can do for riding bulls because it’s an animal; you’ve still got to use your legs to ride horses and everything like that. So we ride a bunch of horses around here and do a bunch of roping and stuff,” he said. Although Mauney faces 6 months recovery after this round of bull riding, after that he should be ready to get back in it and ride the best bulls in the world again, like Bushwacker in 2013 and his 92.75 point ride on Bruiser in 2015 -- both definitely worth a look on YouTube. While driving posts may not be as exhilarating as riding the toughest bulls in the world, we can still get behind the spirit of J.B. Mauney and all the inspiring competitors in the PBR world finals. Visit our website to learn more about the best t-post driver.